This is a personal development program designed to teach you how to handle or destroy any social games, avoid manipulation, identify dangerous personalities, and forge a connection with just about anyone. "It Is An Awesome Product"
I just got Carlos Xuma's Power Social Skills a few months ago, and I must say it is an awesome product. This product isn't directly related to "Pick Up", but it is filled with information that can be used all the time. It covers over the many, many ways that people try to manipulate others to get a desired action or behavior. Not only have been able to stop myslef from getting manipulated, I also realized that I have used these same negative tactics in the past as well. The product shows the fundamental emotions that people use to manipulate others in a negative way: Fear, Obligation and Guilt. It shows the how to deal with insidious Passive-Agressive personality and gives many tactics to create Win-Win situations when dealing with these difficult people. The product also covers every imaginable social game that people play with each other. A very informative product that I recommend for everyone, Men, Women, young & old. 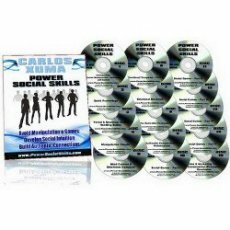 Power Social Skills by Carlos Xuma is not only In a class by itself ,I consider it the most insightful and interesting program I have ever purchased, well worth money and time . Goes far beyond women and dating . It encompasses any area that all of us socialize. Clearly defines many types of manipulative behaviors , how to identify and deal with. To become the best you can be, one needs to overcome all the greedy and negative selfish people that we all encounter daily. Even the program is delivered in a nice vinyl binder with individual sleeves to protect these works of art. Carlos is articulate and easy to follow. The god of self help and PUA guros .